We've been seeing lots of Monarch butterflies in the garden - but they never stay still long enough for me to take a picture of them. Those are the ones with an amazing migration journey to Mexico and back every year. 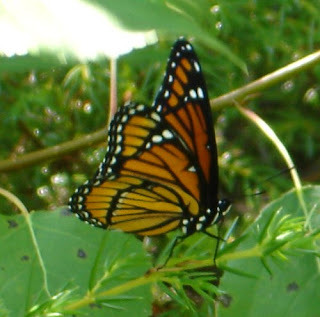 The picture is of a smaller butterfly which mimics the Monarch almost perfectly in its colouring but, unlike the Monarch, consented to sit still for a few seconds so that I could take its picture. It's called a Viceroy. The other insect we've been hearing but haven't yet spotted is called a Dog-Day Cicada or Harvest Fly. The male's song is an incredibly loud and fairly high-pitched shrill buzz which sounds like it's coming from a power cable or electricity sub-station. Apparently they live under ground for 2-3 years and then emerge to mate before dying off. They're not the same as the ones that all emerge at the same time every 17 years, so these ones can be heard every summer. We're running low on water again, although today we're having the new water cleaning system installed, so at least the water we have will be clearer and less stinky than it was before. Then we'll have to improve the actual supply - perhaps by drilling down a bit further in the existing well. 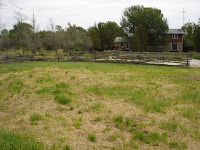 Our neighbours told us that their well is 35 feet deep, so perhaps we should try and aim for something similar. It's a bit frustrating when you can see the lake in front of the house, there are frogs gambolling about in our pond a couple of hundred metres behind the house and we yet have to ration water use indoors. I keeping thinking about Jean de Florette, but trust that our water situation never gets quite as bad as his did. In the short term we will just have to hope for some decent rain in the next week or two. There were two Northern Leopard Frogs hopping around the garden the morning after I wrote the entry about frogs. Managed to get some photos without attracting the dog's attention to the frogs too much - he's grabbing anything he sees in his mouth and I didn't want to see the frogs being dismembered! 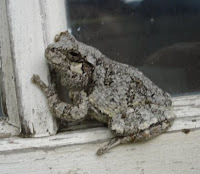 This little chap is a Gray Tree Frog. It was snoozing on our back door this afternoon. We've noticed loads of frogs: around the pond, where you'd expect to see them, but also in the fields and around the house. Most of them are Northern Leopard Frogs. Apparently in this area we can apply for a Commercial Frog Licence to harvest the northern leopard frogs and sell them as bait to fishermen. But I don't think I'll be doing that. Oh, and remember the bat problem that we originally thought was a squirrel problem? 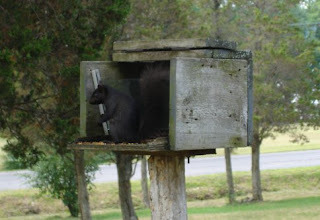 Turns out it is a bat and squirrel problem - Mike saw a squirrel going into the roof space yesterday. So the wildlife removal expert who was sure that squirrels and bats would never share the space turns out to be slightly less expert than I thought. P.S. In case you were wondering, the big concrete cylinder behind the dog is our well. Walked up to the hayfield this afternoon to see how the guys had done. 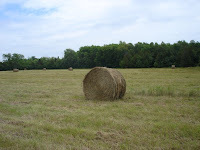 They were baling the hay on Sunday and we counted 38 bales standing in the field today. In the barnyard, Mike has almost finished clearing the long grass from the largest of the three enclosures (Barnyard One), which we estimate to be around a third of an acre. Which is about the size of four standard UK allotments, if I've got my measurements right (gulp). Next step will be to decide how we're going to divide up the space and bring it into cultivation. In between looking after the puppy, making meals and washing up I spent much of the weekend taking it in turns with Mike to read the last Harry Potter book. The kids weren't particularly interested, although I have read all the earlier books to them. Think this one might be one that they have to read for themselves when they're a bit older. I knew I'd have to finish it on Sunday or I'd be unable to do anything approaching work until I had. Got a dog licence for Toby yesterday. For our $20 we got the licence itself, which lasts until the end of March, and a metal dog tag (yes, literally) with the number of the beast on it - 660 in this case. 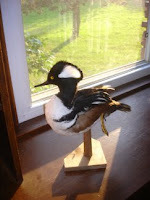 We also registered him with a vet in Trenton. We haven't managed to register the humans with a doctor yet though. I had a bit of crisis of confidence about this blog the other day. I remembered those horrible round-robin Christmas newsletters that some people send out - the ones that tell you how wonderfully people you've often never heard of are doing in whatever they turn their hands to - and I wondered if by writing this blog I was doing the same sort of thing. I resolved my crisis by deciding that mostly I'm writing this blog for myself and those people I think might be interested - I'm not actually forcing anyone to read it if they don't want to. But that's the same for all blogs and bloggers, I suppose. I've just noticed that the spell-checker built into Blogger doesn't recognise the words blog, Blogger or bloggers. How strange. 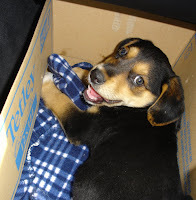 One of the deals we made with the children about emigrating was that we would be able to get a dog in Canada. Or was that one of the deals I made with Mike? Anyway, he spotted an advert from a dog rescue centre this morning for eight-week-old German shepherd/labrador puppies. They just happen to be two of his favourite breeds of dog, and I was keen to get a rescue dog and not particularly enthusiastic about getting a pure-bred one. We drove up to the rescue centre, which was north of Madoc, about an hour and a half away. There was another couple there who had already chosen one of the eight puppies. Alsatiadors? Labrasheps? They were all mostly black, with small amounts of tan. It seemed as though it was going to be impossible to choose, but then Mike picked up one with white paws and a white chin, who snuggled into his arms in a really placid way (and who seemed less inclined to chew everyone's fingers than his siblings). So we chose him. We've made up a little bed in a box in the mud room for the time being and he's flat out asleep in there at the moment. I think it's going to be an interesting few weeks. Last night one of our new neighbours offered us some irises that his wife had been dividing. I said 'Yes, please'. Then this afternoon I spent an hour or two clearing weeds and overgrown perenniels to make space in the front garden for them. That made room for twelve, with about 30 small iris plants remaining in the carrier bags, unplanted, and making me feel inadequate and somehow ungrateful. It was interesting that their accents became increasingly English during the hour or so that we talked to them: to begin with I wouldn't have identified them as being originally British. Joan did pronounce tomato as 'tomaydo' towards the end of the conversation, so I wonder how long it'll take me before I do that. At the moment I think 'never', but that might change. 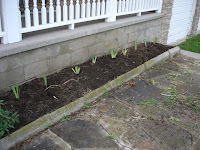 Once they'd gone I got on with planting the remaining irises, behind the house this time. The soil under the fence at the front of the barnyard proved to be wonderfully rich, soft and easy to work (courtesy of the cows that used to live there), so in the end I got them all planted and now feel that I've done my neighbourly duty (although the stiff muscles in my back disagree). 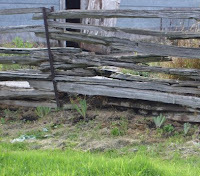 If the soil in the rest of the barnyard is of the same quality as that stuff then I'll be an extremely happy gardener. The bad news this morning was that the robins' nest had fallen off the light and there was no sign of the baby robins. Child #1 was a bit sad (so was I), but it did give her a chance to get a close up look at a (partially de-constructed) birdsnest (complete with mites, yuk). 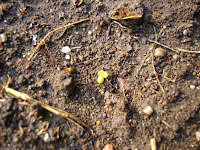 The good news was that the rocket seeds I planted on Monday morning in the flower bed in the front garden had germinated this morning. It seems to be hard to buy anything apart from Romaine lettuce here, so getting a range of leaves in the ground seems like a good plan. Yesterday the first of our hay was cut by a couple of cattle farmers who were keen to take it off our hands. They used to cut the hay for Jerry, the previous owner, too. They reckon they'll get 40 bales off the field - and they're going to pay us for the privilege, which is great. 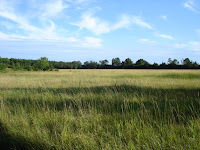 First they had to cut their way to the hayfield, as the path up there had become very overgrown and their hay cutter was 14 feet wide. In the end they only had time to cut a first swathe around the edge of the field yesterday. 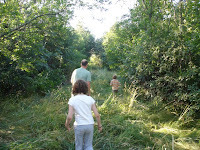 In the evening we had a family expedition up there and walked around the field for the first time. It was a lovely warm evening and we had to keep pinching ourselves as we walked - does this really belong to us? Of course the answer to that is 'no' - we're just looking after it for a while. But, all the same, it still seems amazing, after our 100 metre square back garden in England. Child #1 spotted a cricket in the cut hay and then I noticed a praying mantis just nearby (which proved impossible to get into focus!). The other visitor yesterday was a tree surgeon who is going to trim the branches of the ash tree which are resting on the roof at the back of the house. He's also going to cut down two lovely poplars which are entangled with our power lines. It's a shame, but we will be able to burn the wood so at least they won't go to waste. This morning was focused on utilities. Mike talked to a man about improving our smelly water, while I chatted to the chimney sweeps. What we thought was going to be a straight-forward job of sweeping the two chimneys turned into a several-thousand dollar bill as we discovered that neither chimney met current regulations. The chief sweep refused to touch such badly-put-together items. So the steel flue for the woodburning stove is going to be replaced and the stove itself re-seated on a hearth-stone that is the proper size. In the living room we're having the chimney lined with a new flue and a new wood-burning fireplace fitted. Ho hum. Getting the water fixed is going to be pricey too, but that really needs doing - at the moment the kids are really objecting to having a bath as the smell of hydrogen sulphide from the water is so strong (and the water is grey!). Bubble bath helps a bit, but the resulting combination of smells is almost as bad as just the hydrogen sulphide. The new system should get rid of the smell as well as the lime and iron. In the future we will be able divert the reject water (which would otherwise go into the septic tank) through a grey water system which will fill the toilet cisterns and can be used for watering the garden. 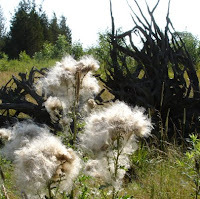 We noticed this nest when we looked around the property in April. It's on the spotlights above the garage doors. This must be the second brood - there are at least two baby American Robins whose heads you can sometimes see wobbling about as they wait for food. You can just see the mouth of one of the chicks in this picture. 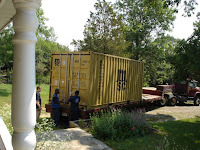 We met the guys and the container at the Trenton air force base, where we had to complete the documentation for customs. It was all very relaxed and friendly - as usual we were teased about the amount of snow we can expect here in the winter. Obviously the English inability to cope with snow is famous world-wide. At the moment I'm looking forward it, but by the time it arrives I might have changed my mind. We drove back with the lorry following us. It then took the men forty minutes to actually get the truck up our drive. Once they got it in, they were very quick at unloading and had finished in a couple of hours, which was very impressive considering the heat and humidity they were working in. I spent the whole afternoon unpacking the kitchen boxes and trying to find space for all the stuff in a kitchen which has fewer cupboards than our old one. So the kitchen is pretty much straight now, but the rest of the house is full of boxes still. We had our tea sitting at the kitchen table, which was absolutely delightful after a fortnight of eating off plastic plates on our laps. As we've put the dining room dresser next to the table in the same layout as it was in Manchester, it felt rather as though we and the furniture had all been picked up from the old house and dropped down into the new one. I'm sitting at the table now - it's a lot easier to type than it was being crouched on the floor! It still seems amazing to me that all our possessions made their way here at all. 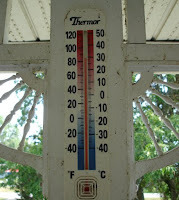 Shortly after the men left we had an almighty thunderstorm, which dropped the temperature down nicely for the evening. By 8.00pm I was completely exhausted and went to bed - before the children! They were watching Doctor Who, which is showing a couple of months behind the ones in UK, which is handy as they missed lots of episodes of the latest series. As soon as we moved in we became aware that we had former tenants still in residence. At night as we went to bed we could hear scuttering noises in the roof space. We thought that it was probably squirrels and we called in a wildlife expert yesterday to investigate for us. He went up into the loft and I waited anxiously to find out whether they'd made a complete mess up there. He couldn't actually see any evidence of them, but could hear something. He went up to the hole in the soffit on the west side of the roof and couldn't see any evidence of squirrels or racoons or birds, but decided that it was possibly bats, living in the space between the side of the house and the aluminium siding. He told me that we can't do anything about them at the moment (if it was bats), as they would have baby bats there and it isn't considered to be good practice to disturb them at this stage (although they're not officially protected here in the same way as bats are in the UK). He recommended that I watch the gaps at dusk to see they were bats. So I did, and they were. As the sun set I saw them leaving from a gap in the eaves. I'm actually quite relieved that it's bats - they're not damaging the loft space and somehow the idea of bats is less disturbing than squirrels. The wildlife guy will come back later in the season, once the babies are able to fly, and put in a one-way door that will let them leave but not come back. I hope they'll just take up residence in one of the barns instead. Looks like they are the imaginatively-named Big Brown Bat. Oh, and the wildlife guy's name is Hunter. Heard today that our container should turn up on Monday. Thank goodness - fed up of sitting on the floor and eating off plastic plates! I gave in and bought some wine glasses last week because I couldn't bear drinking out of plastic cups any longer. Our beds arrived on Tuesday, so we don't have to sleep on mattresses on the floor any more, which is a great improvement. Bought duvets and pillows yesterday. 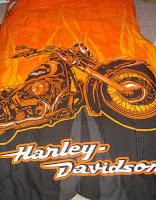 Child #2 had set his heart on orange bed linen (he's going through a bit of an orange phase at the moment) which I thought might prove tricky, but Sears had a lurid Harley Davidson set which fitted the bill perfectly. Mike is getting on well with clearing the farm yard of grass, although it will take several weeks to get the whole thing clear. On Tuesday he started looking at tractors. I was given A Short History of Tractors in Ukrainian by a friend at the conference in Kingston, so I was able to tell him a bit about John Deere. We've still got issues with water, although there was rain yesterday which should help a bit, and there's been more today, which is typical, as I've put two loads of washing on the line. We treated ourselves to a meal out last night. It felt slightly surreal as Wimbledon was playing on the TVs in the restaurant. Tomorrow our new fridge should arrive, which will be a big help, as we've been coping with the tiny one that was left in the house up to now, which isn't really fit for the needs of a family of four in a warm summer. I forgot to mention the weirdest thing that was left in the house. 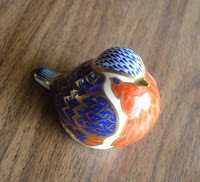 The kids think it’s horrible, and I did too, at first, but I’m beginning to feel quite fond of it, though I prefer the little robin that my aunt gave us as a leaving present. There were a few instruction books left in the house too, which have revealed that the previous owners were called Jerry and Mary. The wood-burning stove only dates from 2004, so that’s fairly new. A farmer we spoke to yesterday reckons the house has been empty for a couple of years, although there was a tenant in here when we looked round it in April. I can’t believe that we’ve only been in the house for 48 hours. Seems like we’ve been pretty busy most of that time – mainly discovering things that need fixing. The biggest problem we’ve had was to do with the water. When we moved in on Sunday afternoon the hot water stank of hydrogen sulphide and we were running out of water in our back-up cistern, so we got the pump guy to come round today and he spent three hours here putting in a new pump. It’s been quite an education for me, learning about plumbing from one’s own water supply. It is our first real bit of self-sufficiency, even though the system was already in place, so probably doesn’t count. The pump guy’s mate had switched the supply over to the cistern last week, as the pump was struggling to get water from the well, but we had nearly run out of water in the cistern. This is just a huge square plastic container in the basement, about three metres square, which is fed from the rain water which falls on the house. The pump can either run off the well or off the cistern. Wells can run dry here (and there’s been little rain for several weeks (in contrast to the UK! )), so the cistern acts as a backup, and also has softer water than the well. The old pump dated from 1989, and was fairly knackered, so was probably due for replacement. It’s such a relief to have a water supply again – we’d been being incredibly mean with the water yesterday and this morning, which wasn’t much fun. I was trying to plan meals that didn’t involve boiling water. The temperature hit 30 celsius today, so Mike and the pump guy were in the best place, as the basement stays nice and cool. We found some spare louvre doors down there today, and a whole load of Mary’s glass bottles and bottle-tops which may well come in useful next year if I end up pickling anything. Mike spent the morning with his new petrol-driven strimmer, clearing some of the grass from the fenced area next to the small barn. He’d started yesterday with a rechargeable electric strimmer, but it wasn’t making much of an impression, so he’s gone for the more industrial version and is making some headway with that. I phoned my Dad last night and heard from my aunt and mother-in-law today. The phone connection is fine – hard to believe that they’re so far away. The only thing I keep forgetting is the time difference. We also had a call from the estate agents in Manchester yesterday – to tell us that someone has put in an offer on our house there. Hurrah! So we’ve accepted it and are hoping that will progress quickly. This house needs a new kitchen and bathroom, and the sale of the Sale house would come in handy for that.